I had to leave my beloved city for a bit. When I found out I needed to take a leave for work for reasons I couldn’t wrap my head around, it seemed to be the end of the world. I love my city. I love my people in my city. I crave stability in life. I don’t like living out of a suitcase any more. I want to be settled and married and be in one place. Instead of that I had travel and upheaval and scary decisions to make. I had questions unanswered. To be fair I still have questions unanswered. I saw one overarching lesson I couldn’t run away from every day the last six months. Ironically the lesson is one of the things I struggle with most in my faith. God shouted it clearly over the miles, the timing, the places I went, the people I saw, the people I left, the lessons I learnt. I was plucked out of my city and sent elsewhere for many reasons exactly when I needed to be elsewhere even though last January I couldn’t have imagined one good reason for it. That means he is in charge and in control and rules (sovereign, think “king”) even when I forget. Not only is He sovereign but He is good. I am a girl with many questions that don’t have answers. But the one thing I saw so clearly and loudly the last six months is that God is sovereign and his timing good. A lesson for me, the one who shouts at God over these things sometimes. And now I am back and in my beloved city and still feeling tossed about over the future and I am thinking.. remember what he showed you.. he is sovereign and in charge and knows. Even when I don’t. 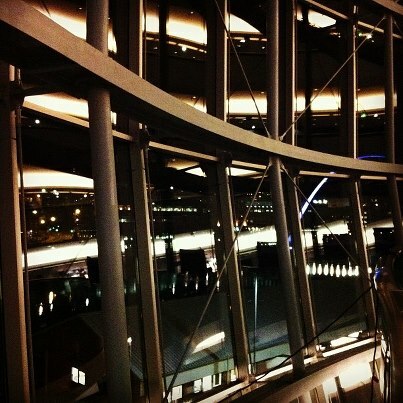 Back.. in one of my favourite places for an evening of reading: the Sage over the Tyne river.. Previous Post Do you understand Hebrew?